My second conference was the spectacular NECS (Network for European Cinema Studies) in Paris, where I gave a paper on echoes of Frankenstein in Black Mirror and Penny Dreadful. This paper was part of a larger piece of research that feeds into a journal article I’ve been working on. 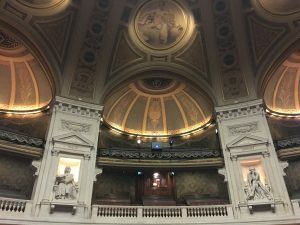 With over 600 delegates, NECS was one of the largest conferences I’ve ever attended, and with scholars from all over the world it was wonderful to hear so many different languages being spoken during the breaks and at the reception, held in the stunning old Sorbonne. Finally, my last conference of the summer was a panel on Feminist Pedagogies, Feminist Classrooms with my colleagues Tara Thomson and Laura Joyce, at the first English: Shared Futures conference held in Newcastle. This panel grew out of the many conversations the three of us had had over the last couple of years about what informed our own classroom practices. We were able to make an audio recording of this session, and hope to be able to make it available online in the near future. As a result of this panel and the audience’s enthusiasm, Tara, Laura and myself will be taking forward our plans to create an online tool for discussing and gathering together intersectional, feminist resources.